PM Netanyahu speaks with UN Secretary General Antonio Guterres, updates him on details of Operation Northern Shield. 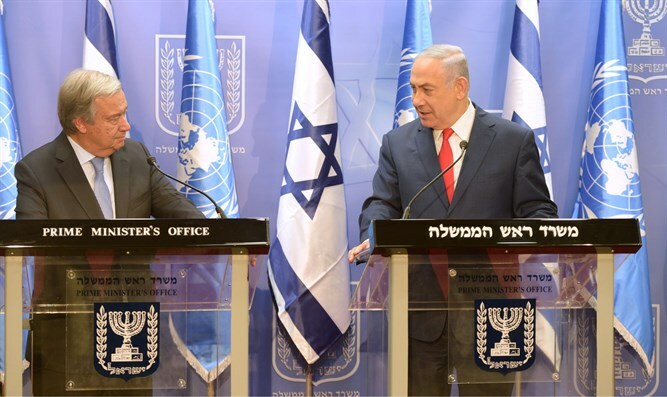 Prime Minister Binyamin Netanyahu on Wednesday evening spoke by telephone with UN Secretary General Antonio Guterres. The Prime Minister said that he views with utmost gravity the flagrant violation of Israeli sovereignty and the violation of UN Security Council Resolution 1701 on the part of Hezbollah. He added that this was an additional part of Iran's aggression in the region. Netanyahu updated Guterres on the details of Operation Northern Shield, which the IDF launched this week to destroy terror tunnels dug by Hezbollah, and said that he expects the UN to strongly condemn the violation of Israel's sovereignty. The Prime Minister also told the UN Secretary General that the international community must join in the demand to impose increased sanctions on Hezbollah in the wake of the events. Earlier on Wednesday, an IDF team participated in a pre-scheduled trilateral meeting, chaired by the UNIFIL Force Commander and Head of Mission Stefano Del Col, with a team from the Lebanese Armed Forces. According to the IDF, the meeting focused on the IDF’s exposure of the Hezbollah cross-border attack tunnel dug from Lebanon into Israel. The IDF expressed its protests regarding the severe violation of Israeli sovereignty and UN Security Council Resolution 1701. A senior officer in the IDF’s Northern Command said Wednesday that Hezbollah was surprised and deterred by the operation to destroy terrorist tunnels on the northern border. According to the information gathered by the army, the purpose of the tunnels was to enable Hezbollah's forward and rapid force to break out of the tunnels, to take control of central areas and routes such as Highway 90, to “cut off” the northern town of Metula or additional places, and then to allow additional forces to pass through the fence into Israeli territory.